Location: Connemara region of County Galway, Ireland. 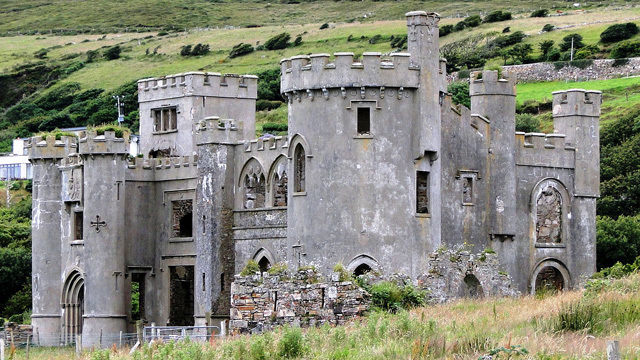 Notes: Clifden Castle is a ruined manor house west of the town of Clifden in the Connemara region of County Galway, Ireland. It was built circa 1818 for John D'Arcy, the local landowner, in the Gothic Revival style. Uninhabited after 1894 it fell into disrepair. In 1935, ownership passed to a group of tenants, who were to own it jointly, and it quickly became a ruin. The estate faces south and overlooks Clifden Bay. It was constructed in the Gothic Revival style, popular in the early 1800s. The Castle's original features include a rounded tower to the southeast, a square tower and an entry tower with two round turrets. However, most current decorative features date from the 1850s/1860s and were added by the Eyre family. The estate also includes a large gateway, built in 1815 in the medieval style. In addition, D'Arcy had several standing stones erected on his property, four remain along the winding path between the gateway and the house. One of them might in fact be a genuine prehistoric worked stone, brought in from somewhere else. To the west of the Castle, a substantial enclosed farmyard was constructed. This comprised a grain store, workers' cottages, stable and coachhouse. Next to it was a walled garden, with a well and pond nearby. On the Demesne there are also the remains of a 'marine temple' made of sea shells on the stream to the east of the Castle. Close to the road to the north is a children's graveyard, originally for three Eyre children who died in the 1880s. The former Demesne and Castle are now owned by several families. The gateway is visible from the Sky Road, and access to the Castle is through the gateway along a path that meanders across the hillside to the Castle. The grassland surrounding Clifden Castle is populated by grazing cows, sheep and horses, and part of the castle ruins is used as a cow pen.